While restaurants across the world are making headlines with their no “young” children policies, Chef Victor Barry is moving in the complete opposite direction, closing the upscale and intimate Splendido and morphing the space into a brightly lit and whimsical (while still polished) space that embraces families. Although the main floor welcomes all guests, the lower level is tailored for children with its play area, a distraction allowing parents to enjoy unbothered bites of food. It’s sweet and welcoming, exactly the atmosphere Piano Piano wants to cultivate: a place where you feel like you’re dining in their home and gives you time to deepen family relations. Given our waitress raved about the egg yolk raviolo ($16), we felt obligated to try the appetizer portion to start. 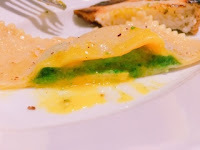 The typical spinach and ricotta stuffing is augmented with an egg yolk sandwiched between the sheets of pasta. 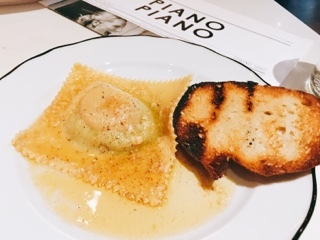 As you break through the raviolo, the molten egg combines with the salty parmigiano shavings and nutty brown butter to create a rich savoury sauce. It’s a wildly inventive dish and absolutely delicious if it weren’t for the ultra al dante pasta edges. 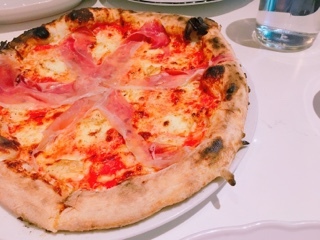 Having read all the rave reviews about Piano Piano’s pizza, we opted for the Smokey Bear ($22), an uncommon combination of soft fior di latte cheese, smoked mozzarella, and salty smoked cured speck. Perhaps it’s unfair to complain that the pizza was too smoky (after all, it’s named the Smokey Bear), but with the pizza’s chewy crust already well-blistered, all the other intensely flavoured ingredients were too much. My taste buds were desparately crying out for something refreshing to balance it out – a lightly dressed arugula on top would have been a perfect respite. 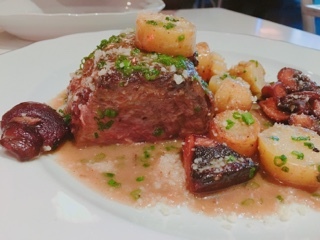 The braised short rib ($28), not surprisingly, simply broke apart with a press of the fork; so tender you couldn’t even feel the distinct grains from the beef … everything seemed to meld into one luscious piece. For my friend, the soft texture almost had her thinking the beef was past its prime. After laser focusing on the taste, I can see her point – there is a slight funk. 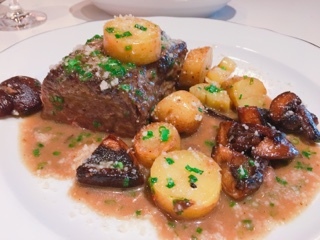 Possibly, the meat was wet-aged, which breaks down the fibers while retaining its juices, but does leave an almost musky flavour and aroma in the beef. Despite sharing what we thought was a manageable amount of food, the richness of the dishes left us as full as dining at Nonna’s table on a Sunday. Nonetheless, the nutella tiramisu ($9) called. 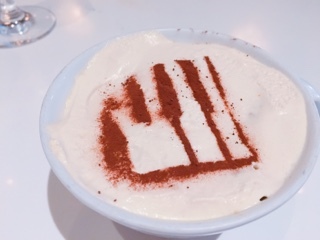 On top of the tea cup sized dessert was a whimsical piano keyboard made from cocoa powder. Like the other dishes, the tiramisu was surprisingly rich for the small size – there was no skimping on the mascarpone and in lieu of lady fingers a rich vanilla cake was used. Having had my fair share of tiramisu, I like Piano Piano’s rendition, a sweet and satisfying ending. While I’m still disappointed that I can longer enjoy Splendido’s deliciously extravagant brunch, it’s nice to see better dining options for families with young children. For me, a childless diner, the playroom and separate dining area are meaningless and if anything made me hesitant to visit. Hence, it was a pleasant surprise that the play area wasn’t prominently displayed like a McDonald’s playground. Truth be told, if I hadn’t read-up about the restaurant before visiting, I’d be none the wiser about Piano Piano’s family friendly nature. There were no screaming children and the atmosphere on the main floor was like any other restaurant. Thankfully, the music was at a reasonable volume so I really felt I could converse with my friend. The food may not be as stellar as its predecessor, but Piano Piano is a comfortable and welcoming environment, a place that encourages you to connect and of course, mangia.